Stephen Glennon’s Tribeswomen wrestled the title back from Mayo to claim a fifth Connacht win in six seasons. Leonard: scored 0-9 to help Galway to victory (file photo). TRACEY LEONARD AND Mairead Seoighe sparkled as Galway captured a 14th TG4 Connacht ladies senior football crown at Elvery’s MacHale Park on Sunday. Stephen Glennon’s Tribeswomen wrestled the title back from Mayo to claim a fifth Connacht win in six seasons – as Leonard and Seoighe combined for 2-11. Leonard scored nine points, including two from play, as Seoighe chipped in with an impressive 2-2. Mayo, beaten All-Ireland semi-finalists last year, were desperately below-par and now face a difficult route through the qualifiers, as Galway take the direct road to the quarter-finals. Ahead by 3-7 to 0-4 at half-time, Galway never looked back and while Shauna Howley’s goal in the 38th minute briefly hinted at a Mayo revival, it never materialised. They were unlucky when Fiona Doherty rattled a shot off the crossbar soon after, while star forward Cora Staunton tested the woodwork from a viciously-struck free later in the half, but Galway were deserved winners. Those three first half goals paved the way for victory as Galway took full advantage of the breeze at their backs, in front of a big crowd in Castlebar. After Galway had streaked two points clear early on, a poor restart cost Mayo a goal to Seioghe in the third minute. In the fifth minute, 2004 All-Ireland winner Niamh Duggan, who was briefly on the pitch as a blood sub, made a huge impact as she netted to finish a flowing move involving Aine McDonagh and Seoighe. Galway missed other goal chances in the first half as they carved Mayo open but their third major arrived in the 25th minute, as Seoighe struck again. Mayo had struggled desperately in that first half, registering just four points and one from play, from Sarah Rowe, as Staunton landed three frees. When the dust settled, a usually slick mayo outfit had managed just 1-2 from play in the entire game – as Staunton top-scored with seven points. Crucially from a Galway perspective, the off-colour Mayo ace managed just one point from play in the match, a late effort when the end result was not in doubt. Galway would finish the game with 14 players when Noelle Connolly was sin-binned in the 55th minute for hauling down Staunton – but Glennon’s charges managed to cruise comfortably to another Connacht win. Olivia Divilly claimed the player-of-the-match award and on this evidence, Galway could emerge as serious dark horses for All-Ireland glory, in what looks like an open field this summer. Scorers for Galway: T Leonard 0-9 (7f), M Seoighe 2-2, N Duggan 1-0, A McDonagh 0-1. Scorers for Mayo: C Staunton 0-7 (6f), S Howley 1-0, S Rowe 0-1. Galway: D Gower; F Cooney, N Connolly, E Flaherty; A Seoighe, B Hannon, S Burke; L Gannon, C Cormican; O Divilly, T Leonard, A McDonagh; M Seoighe, S Conneally, R Leonard. Subs: M Glynn for Conneally (44), A Davoren for McDonagh (46), S Molloy for Divilly (60). Mayo: Y Byrne; O Conlon, S Tierney, M Corbett; F Doherty, M Carter, D Hughes; C Staunton, A Gilroy; M McGing, F McHale, G Kelly; R Kearns, S Rowe, N Gaughan. Subs: S Howley for McGing (h.t. ), A Dowling for Doherty (51), A Duffy for Kelly (55). Meanwhile, Geraldine McLaughlin fired Donegal to a second TG4 Ulster senior title in three seasons on Sunday afternoon, as Micheal Naughton’s charges claimed a 4-11 to 0-15 victory over Monaghan, writes Alan Gunn. McLaughlin landed 2-6 as Donegal, who won their first provincial senior crown two years ago, claimed the silverware back from last year’s winners. Donegal went to Monaghan’s Clones back yard and announced themselves as All-Ireland contenders with an impressive five-point win. Goals proved crucial as McLaughlin scored two, with sidekick Yvonne McMonagle and Roisin Friel also raising green flags for the winners. In what was a repeat of the 2015 decider, beaten Lidl League Division 1 finalists Donegal emerged victorious again to book an All-Ireland quarter-final spot. Friel struck for the opening goal on four minutes and when McMonagle flicked home their second ten minutes later, the warning signs were already flashing for Monaghan. A lethal Donegal forward line meant business while, at the other end, they were also defensively sound. Ellen McCarron, who finished with eight points, kept Monaghan in touch while the Farney girls also had goalkeeper Linda Martin to thank, for some fine saves. Monaghan had goal chances of their own but McLaughlin struck approaching half-time and Donegal were 3-5 to 0-9 clear at the break. McLaughlin bagged her second goal three minutes after the restart and Monaghan were left with a mountain to climb. Donegal lost Niamh Hegarty to the sin-bin but held tight to the finish. Monaghan, who had penalty claims waved away when Laura McEnaney appeared to have been fouled, had Gráinne McNally yellow-carded in the second half. Donegal: A McColgan; T Doherty, E Gallagher, N McLaughlin; T McCafferty, C Hegarty, A McDonnell; K Herron, K Guthrie (0-2f); G Houston (0-1), N Hegarty (0-1), E Ward; R Friel (1-0), G McLaughlin (capt) (2-6, 0-4f), Y McMonagle (1-1). Subs: P McGroarty for R Friel (43), D Foley for A McDonnell (61). 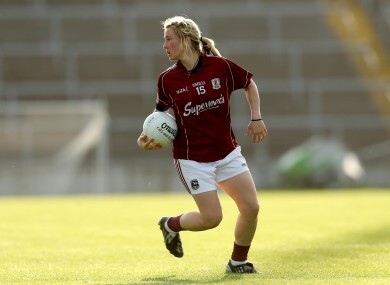 Email “Sunday double for Galway as ladies take football crown, Donegal too good in Ulster”. Feedback on “Sunday double for Galway as ladies take football crown, Donegal too good in Ulster”.